You know how film studios put out teaser trailers for movies that won’t come out for like 9-12 months? 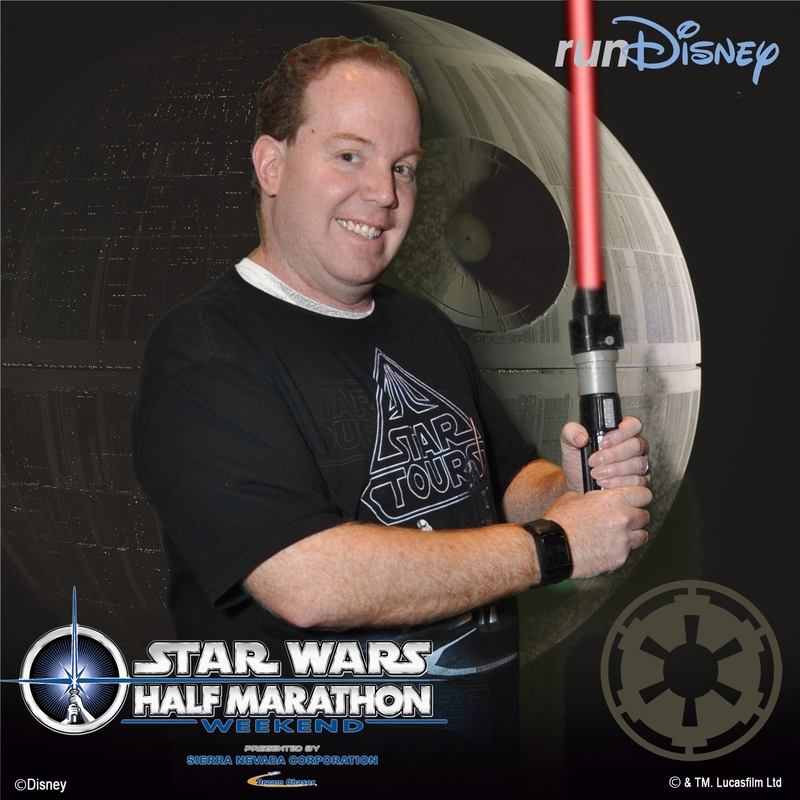 Well, all I have time for this morning is a quick teaser for what I will be reporting on next week on the Star Wars Half Marathon Expo. Traffic was super light for a Thursday morning. So, I arrived a little after 8:30am. The folks at runDisney deserve some major props for showing the Star Was movies for those of us who arrived early while we waited for the Expo to open! 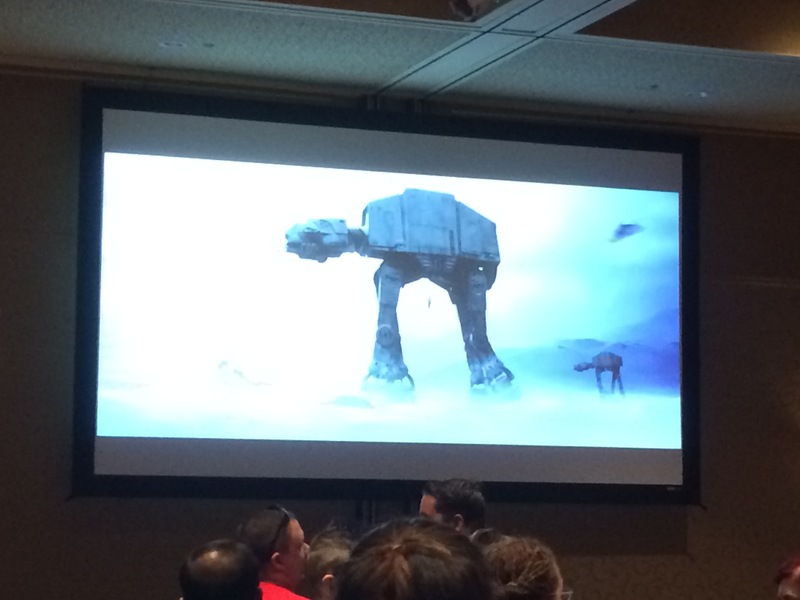 I got to watch part of Empire Strikes Back! 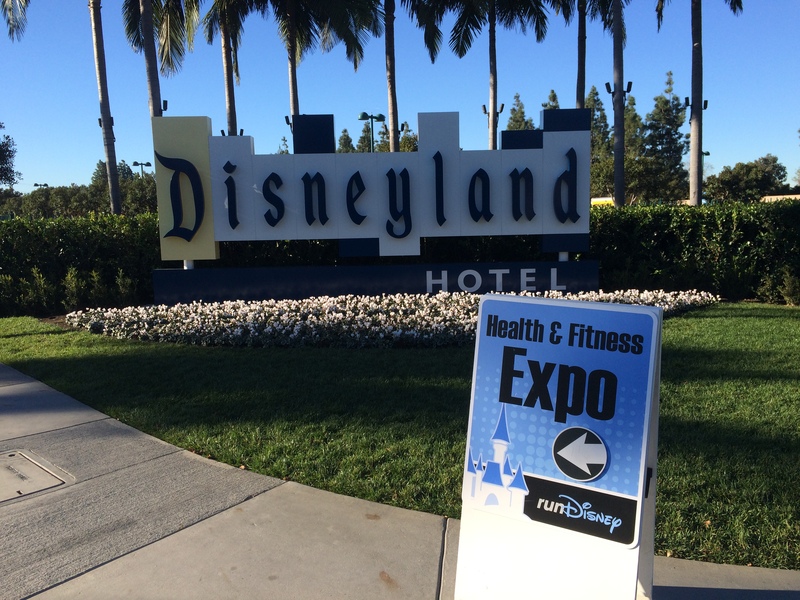 So, runDisney…for the 2015 Avengers Super Heroes Half Marathon Expo, let’s do the same. Okay? 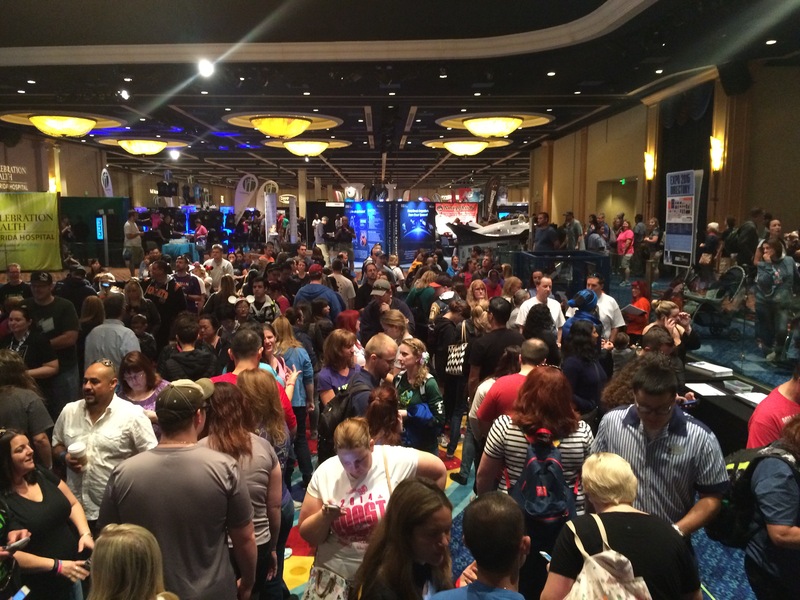 The crowds were not that bad for the first day of an inaugural runDisney race expo. I took this picture once I got to the top-level of the official merchandise line looking back on where I came from. After I got my official merch, I was one happy camper! 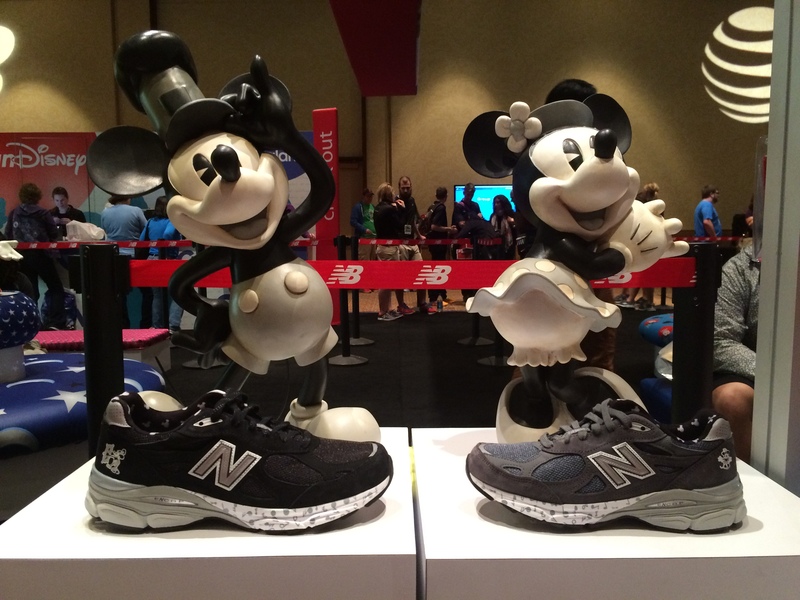 I went over to the New Balance booth to check out the newest edition to the runDisney New Balance shoes. Let’s just say that I was more impressed with this display than the shoes themselves. Although, seeing them in person caused me to consider buying them in the future. I don’t think that the demand for these shoes is quite what they have been previously. I didn’t make a reservation and the sales crew was trying to sell me these shoes. Here’s the free instagram photo you get. You can choose light side or dark side of the force. I chose the dark side. I was wearing a shirt with Darth Vader featured on it after all. Plus, who wouldn’t want a picture with the Death Star in the background? I left the Expo to check out the set up for the finish area of the races. All three races will finish at the same spot. 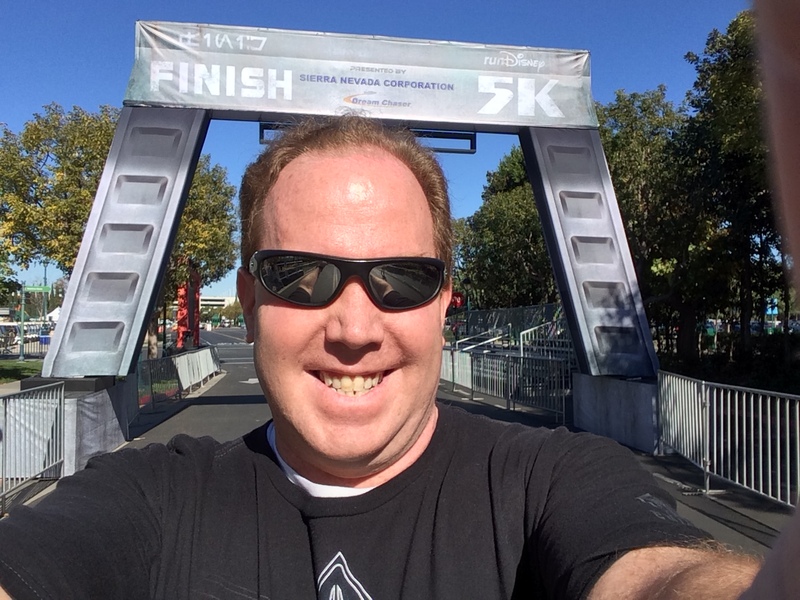 So, the Star Wars 5K finish line was set up and ready for today’s 5K. In Expo’s past, I was a union Disney employee. So, I didn’t have the Main Gate pass I now posses. So, instead of the usual lunch at the Earl of Sandwich in Downtown Disney (which I love), I headed over to DCA. I can’t wait to run through here over the next two days. I think both the Star Wars 10K and Star Wars Half Marathon will run through here. 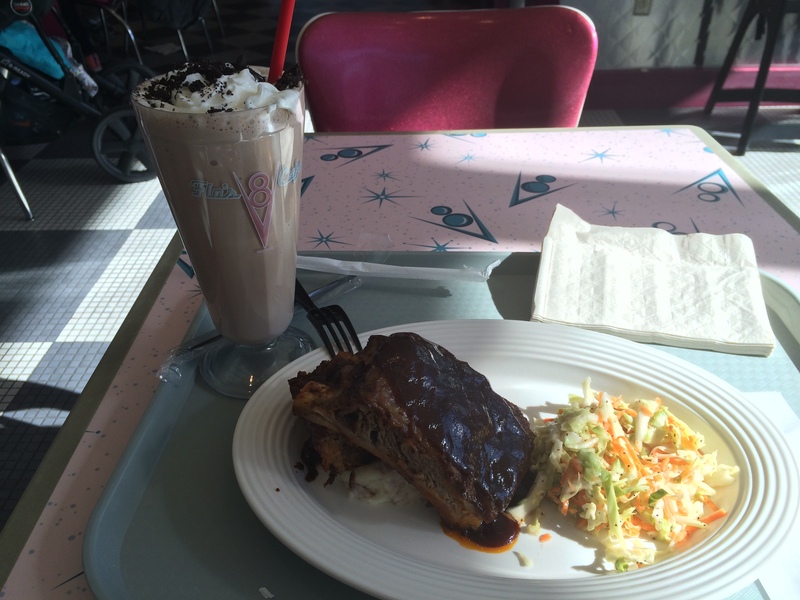 I opted to have lunch at Flo’s V-8 Cafe. I know that the milk shake really kills any chance of this being a healthy meal. However, I couldn’t resist the souvenir glass. The ribs were da bomb! By the way, there are mashed potatoes under the ribs. 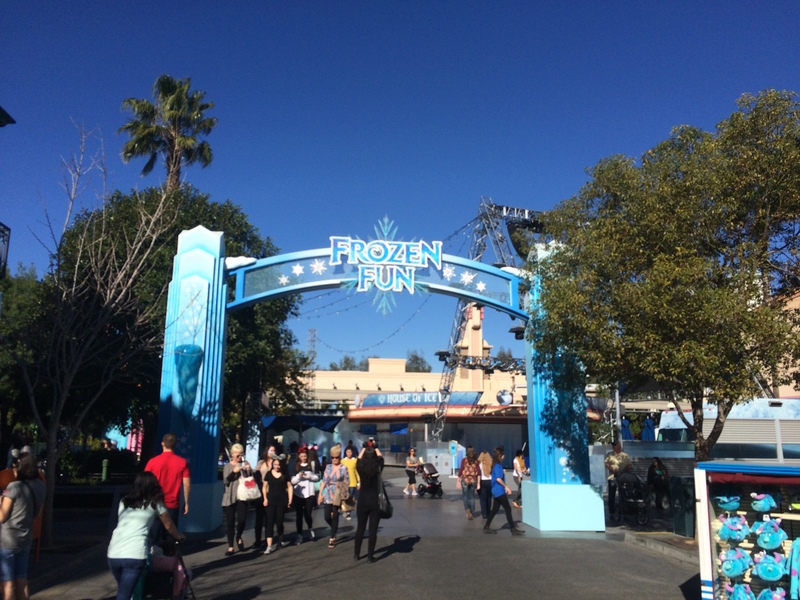 Frozen has taken over the Hollywood Land of DCA! I’m going to have to check this show out this weekend. 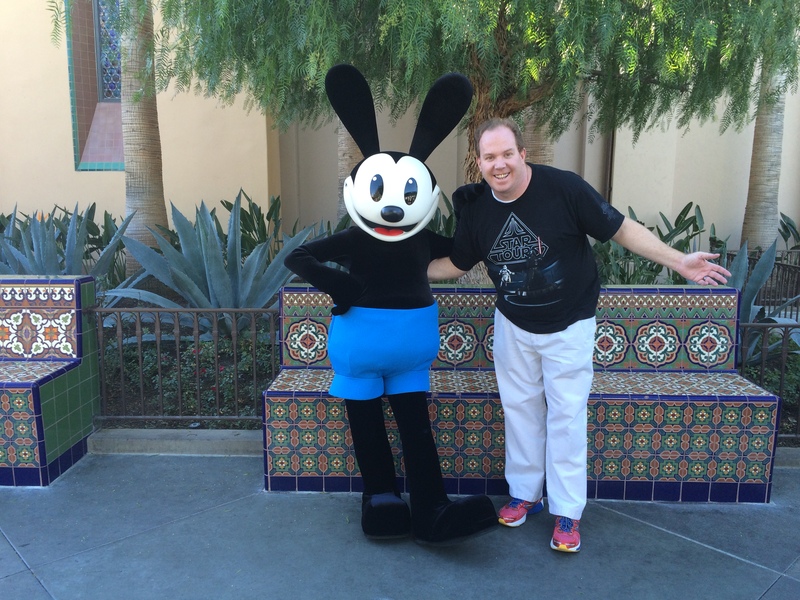 On the way back out of DCA, I ran into Oswald the Lucky Rabbit. I’ve never seen this walk around character before. So, I had to get in line behind all the kids and kids at heart to my photo as well. If you’re a Disney fan, you probably know that Oswald is the whole reason we have Mickey Mouse. Walt had created Oswald under a work for hire situation and lost the rights to this character. He was so mad about it that he created Mickey Mouse on a train ride across the country and the rest is history. Recently, the Walt Disney Company was able to get the rights to Oswald again. So, we can use him as one of ours. I went back to the Expo for a final lap. 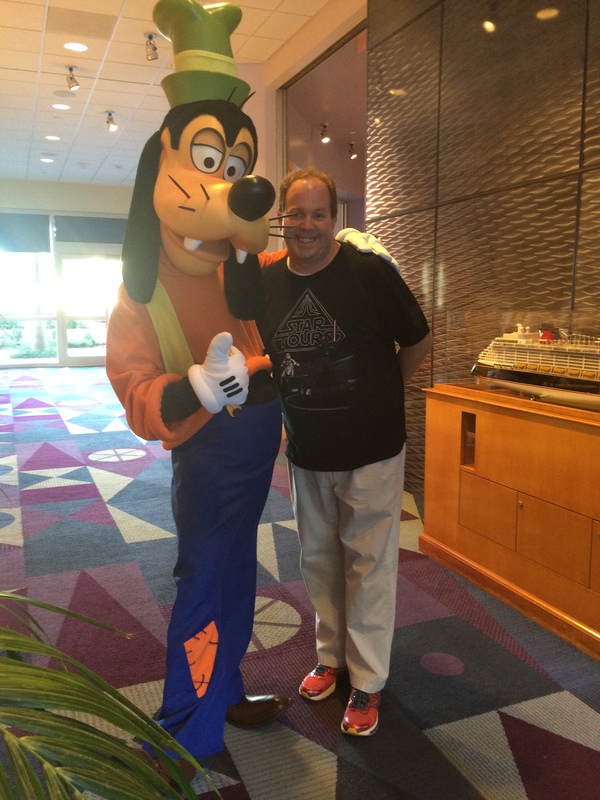 On the way, I ran into Goofy! Couldn’t resist the photo-op. Something to remember as I get set to race this weekend. 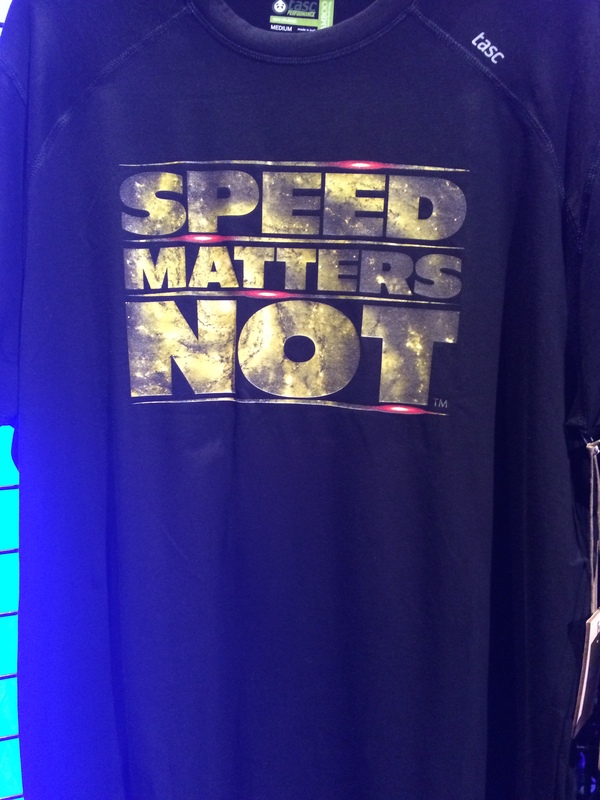 By the way, runDisney was not the only vendor selling Star Wars running related shirts. I’ll share some more pictures of the other clever shirts I saw at the expo. 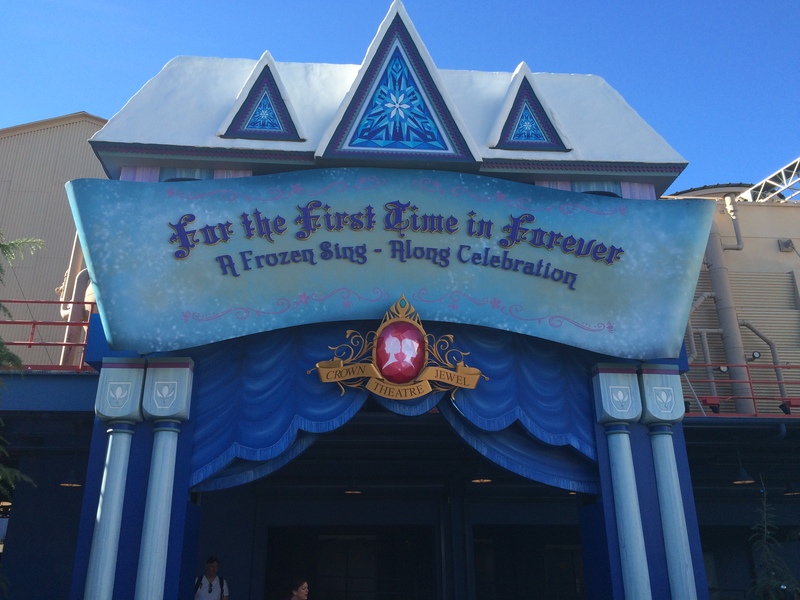 Later this afternoon, Brooke and I will be heading down to the Disneyland Resort. Since you have to pick up your own race bib for this race, I decided to wait and pick mine up with my wife. So, we’ll be getting our bibs and spending the weekend in Anaheim. 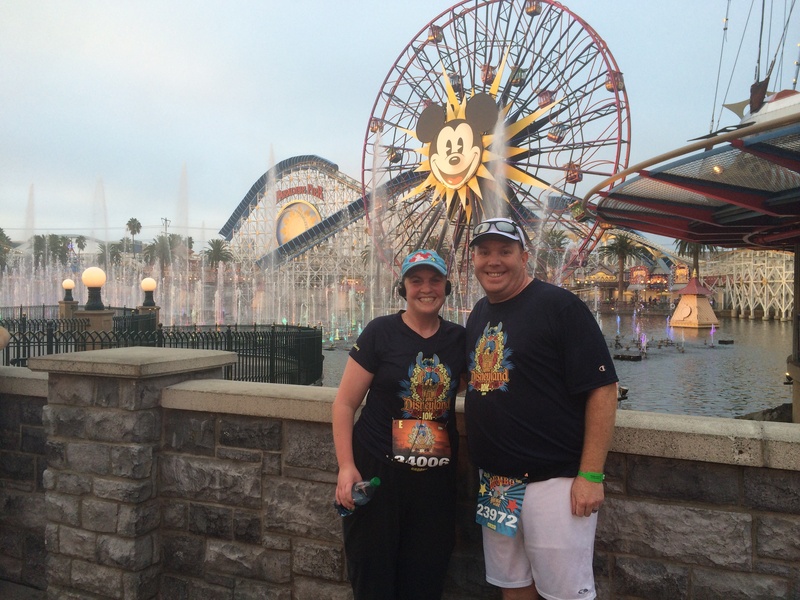 Brooke will be running the Star Wars 10K with me and I’ll run the Star Wars Half by myself. 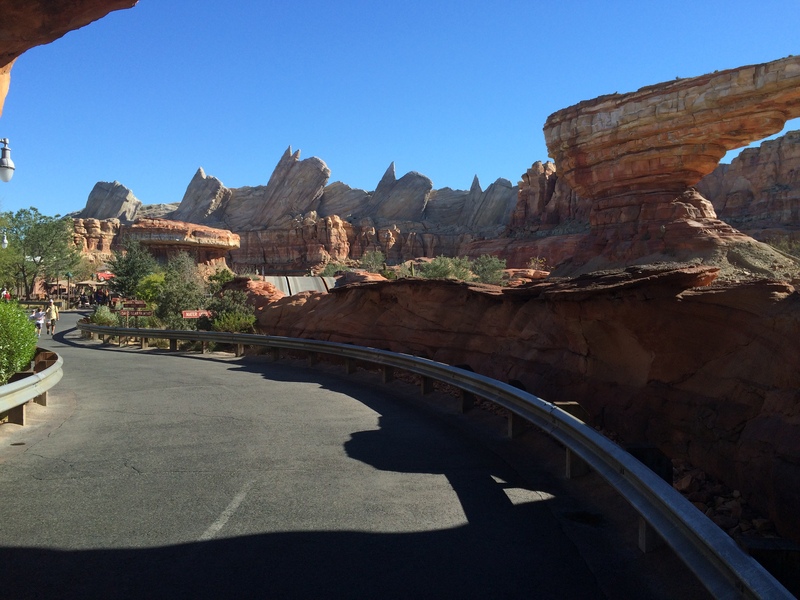 We will also be in the parks today, tomorrow, and on Sunday. So, if you see us around, feel free to say “hello.” I’ve already been able to meet a few blog readers at the Expo yesterday. It’s always fun to meet those of you who actually read my ramblings! I’ve got 19.3 miles of awesome to cover this weekend! For those that are running with me, have fun. May the course be with you and all of us! See you on the other side of the weekend! 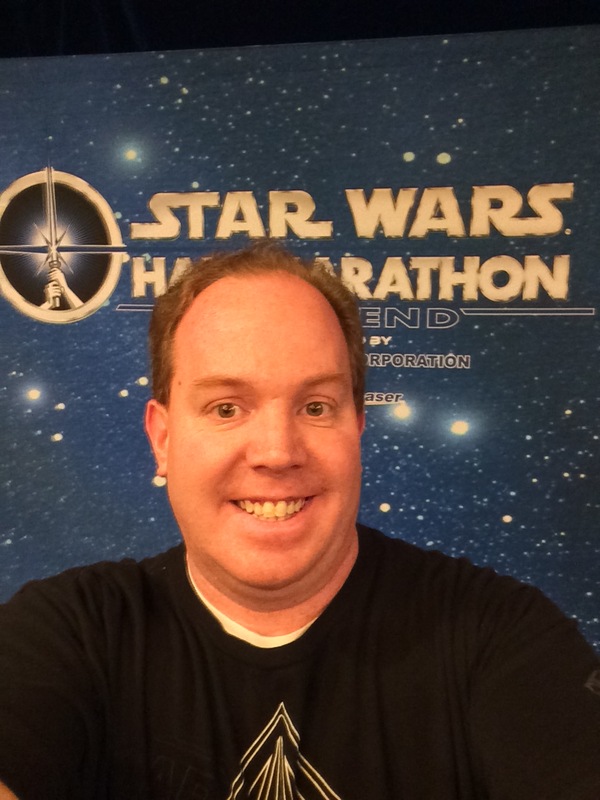 The Force was With Me in Week 3 of 2015!